How are Aggregates Cooled in Reinforced Concrete Plant? Water chillers are used to produce huge quantity of water at 40C to control concrete temperature. The rock grains that have size greater than 5 mm are treated with cold water though spraying with nozzles along the whole length of cooling gallery. The resulting temperature of these treated grains at the end of cooling gallery is ±70C. At the selected location the dewatering action are provided over wet aggregates. At the dead end of cooling gallery the moisture in aggregate grains are kept 2% with the help of dewatering screens. This is an effective method of dewatering from coarse grained aggregate. The water removed from aggregate is treated in sedimentation tank to remove any floating particles and the cleaned water is supplied to cooling circuit for the same purpose. An alternative way of aggregate cooling silo can be used. The water chillers are containerized to supply required mixing water for concrete and used to cool aggregate and ice treatment as well. The ice flakes required for cooling purposes is supplied from two containerized ice plants. 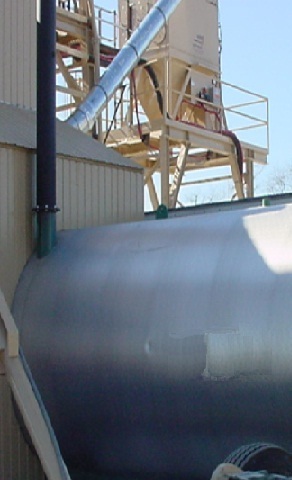 The ice required for cooling is conveyed from ice tanks to treated water. Dear reader we have discussed about ACI 305 in our sister blog Structural, Concrete and Foundation Engineering, which deals with hot weather concreting. Here we have discussed how to cool aggregate for reinforced concrete. These are noted that there have many detrimental effect of hot weather in proportioning of concrete. You can read ‘considerations for hot weather concreting’ of this blog to have some necessary information. We will elaborate these effects in next posts. To avoid these impacts, water is cooled to be used as mixing water. It is found that water of (400-500) F (cold water) can decrease temperature of fresh concrete up to 100F. Wow, amazing concrete plant! and it looks like it is equipped with state of the art technology. I will feel lucky If I visit this plant.